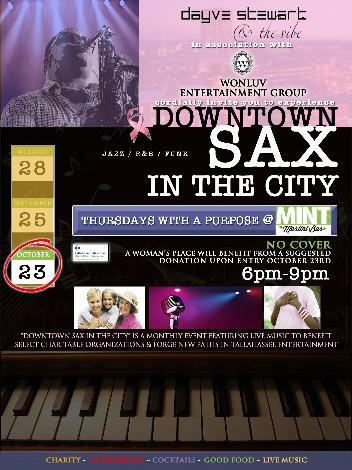 Come experience the sounds of Dayve Stewart and the Vibe while supporting the TMH Foundation - A Woman's Place for Breast Cancer Awareness Month at Downtown SAX in the City in the Mint Lounge from 6-9pm. There's no cover charge -- donations are welcomed throughout the evening. This event is sponsored by Dayve Stewart and the Vibe in association with Wonluv Entertainment Group.